by Dave from The Longest Way Home ~ May 28th, 2012. Updated on November 12th, 2012. Published in: Travel blog » Long-term travel. One could just hop on a plane, bus, or boat and let the wind take you to where ever. It’s a nice idea. I’ve done it myself and it does have a unique appeal. However if someone is planning to be traveling over a long 18+ month period or even longer I do strongly advise them to have a rough idea of where they want to go and what they want to accomplish. Let’s look at how you can plan a long-term travel route and why. It can be online, or in paper format but you should be able to write on it and take notes. Mark where you are now then decide on the must see top ten places you want to visit. 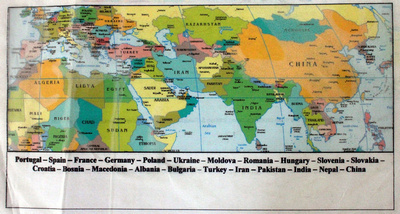 Link them together and you’ve got the roughest of rough maps of the countries you will be visiting. Ideally I would suggest you try to map out an overall global route first and systematically link the main places together. Then link in other countries neighboring to them and see if there’s anything you’d like to visit there too. Next up you’ll need to a have a rough idea of how long your long-term journey is going to be. 18 months, 3 years, indefinitely etc. You are now starting to put together a route map that links everything together. But there’s going to be more to it than just hopping between countries. A lot more. Of all the problems I see amongst long-term travelers and overland travelers it’s having to change routes and destinations due to tourist visas that sits at the top of the list. I’ve met many a traveler who simply could not continue on their chosen route because they did not plan their travel visas properly. When marking out countries you will be visiting on your map quickly look up online if they require you to have a visa beforehand. Or if they offer visas on arrival via plane, or on arrival via overland borders. At the same time look up to see how long their visas are valid for? eg 30 days, 60 days etc. 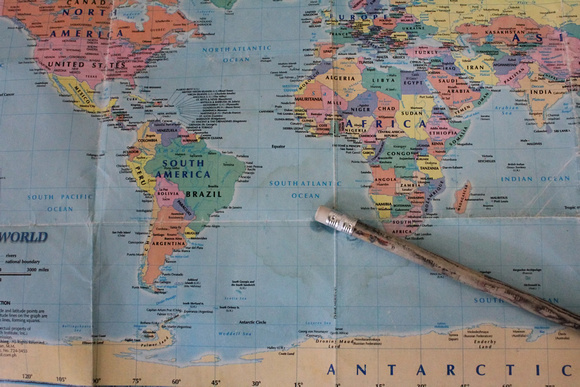 Write the visa requirements down on your map or next to a country’s name on a separate list. This is vital information in planning a long-term travel route. *do note that your current legal residence will play a part on the ease or lack of ease in obtaining a visa en-route. Many countries require you to obtain a tourist visa from your home country. That’s a real problem for long-term travel. The easiest advice to give here is to tackle these countries first on your journey. Russia is a prime example. Getting a Russian tourist visa is no easy feat. They require you to apply in your home country with references, bookings and many more requirements. Doing this when you are already traveling is very, very difficult or near impossible. This applies to quite a few countries and to make it even more complicated a lot of it also depends on your nationality and your country’s current political standing with the one you are applying to. If you do want to visit Russia and your research tells you that you need to apply at home for a visa then you might also want to include neighbouring countries with difficult visas like Mongolia and China. Tackle all three with pre acquired visas from home and you’ve just removed one of your larger headache’s in long-term travel in that region. The other option is of course to return home and apply there or trust in a specialist visa agency. Again, I’m writing this under the assumption that you are long-term traveling and not returning home. Just remember that visas take time to process and they have expiry dates (more on that later). With your map of countries you should be by now pulling together a wealth of up-to-date visa requirements. You’ll know which countries require a visa via applying from home on arrival or from an embassy. If you are approaching several countries that allow you to apply for visas in their embassies then you might consider setting up a base in a neighboring country and applying for them all there. For me I acquired my visas for Iran, Pakistan and India all in Turkey. I’ve also used Kuala Lumpur and Bangkok as bases to apply for visas. Why? Because all of these countries have a host of embassies located in their capitals thereby making applying for visas quite easy. The only issue is that over the past few years embassies have been cost cutting and moving out into suburban city areas. Thereby making if difficult to locate them and find good public transport to bring you there. Quite often you’ll have to get a taxi as there is no public transport. As you might be doing a lot of repeat journey’s to the same embassy this can become quite expensive. Not only that but accommodation in capitals can cost more than in other regions. All in all it can be annoying but it’s still cheaper than flying home every time you need to get a visa. If you are lucky and the embassies are all located near each other you might consider staying outside the capital in cheaper accommodation and take night transport in every few days to check on your applications. One last point with tourist visas for long-term travel. You need to do some math. Visas can often be applied in advance for up to 90 days etc. Depending on the country. So you will need to calculate when you’ll be arriving, how long you will be staying, and when the start of the next countries visa will be starting. In other words be careful on applying to Mongolia for 30 days entering on the 1st and then find out you cannot enter Russia until the 2nd of the following month! Likewise beware of visa expiry dates. A point for car drivers going overland to remember. Do make sure you have all your carnet de passage documentation taken care of during this early planning stage too! Many countries will have specific document requirements. “This just takes a lot of preparation and constant planning. You can work out in advance which countries will not be that hard to enter. And then also work out those that will be hard. Those are the ones you’ll need to work around. For example, travelling to Russia will require an invitation before you can apply. And application fees increase a lot if you want to have a quick result. So leave that one lots of time. For the record there will be another article about long-term travel finances that will go more in-depth than this one. But for the purposes of planning your long-term travel route you should have a rough budget in mind. You’ll then know how much money you have to spend. At this stage you should know the cost of your visas etc. which is a good time to also find out the approximate daily cost of traveling in a country. I budget a country a little differently to many. I start with visas then accommodation. It’s one of the easiest to budget and find out. Hotels, guesthouses and hotels make it very easy to find out your initial expenses. Some self promotion here but do try out my Hotel Search on The Longest Way Home (this link opens a new window so you can try it out, and keep reading here). It covers a wide range of accommodation and you can sort by price. Best of all it’s got a map. A great start for budget planning. Again write down the approximate cost of accommodation per night. After that you can add-on eating out, and transport. From here, you start making budget cuts like staying in guesthouses instead of 1 star hotels in some counties. Or even budget in a single expensive country for hostel dorms and making your own meals for countries. Again, I will be going further in-depth with long-term travel budgets, and finances in a follow-up article. But when it comes to planning your long-term route it’s important to start your basic budget as early on as possible. If anything it will start to shape out journey with a lot more clarity. 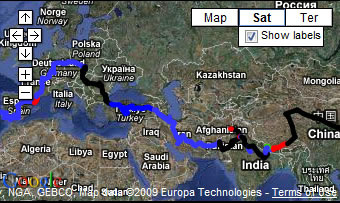 By now you have a rough route forming, an idea of how long you can stay and how much your stay will cost. The next thing you should keep in the back of your mind is the time of year you will be there. Why? Well, if you want to avoid wash out monsoon seasons, standstill freezing snow conditions and overwhelming hot times of the year then this is important. That said, with long-term travel sooner or later you are bound to be in a country during its “worst” time of year. There’s nothing wrong with that per-say but you should really avoid extended periods of being completely soaked in heavy rains, freezing cold or sweating in hot seasons for months upon months. More importantly some countries can grind to a halt during extreme weather. Examples are the South of China during winter where the snow often locks up public transport. Likewise during China’s new year public transport is completely booked up and you may find yourself stuck in place for longer than you would like. Google calendar is a good starting point here as you can import many international holidays into it quite quickly. My advice is to keep local or national festivals in mind but don’t try to make it to every one. You’ll miss out on a lot along the way. I traveled through Romania to catch a full moon in Transylvania, it was worth it. But I also tired myself out. In Nepal there are so many festivals unless you stay there for a year you are bound to miss out on some “must see” festival. All in all I would mark out the dates of important festivals you’d like to see. Keep them in mind but don’t ruin a journey by rushing to one. For me, it’s always been important to mark out national holidays and religious holidays when everything comes to a standstill! Other points to keep in mind include wars, political unrest and natural disasters. Keep an eye on regional news when long-term traveling. I’ve covered a lot here, and I’ve probably left out quite a bit. Keep in mind this is part of a series and I will be likely be going more in-depth a little later on for certain topics. However for now you have the basics on planning a long-term travel journey. Again there are plenty more steps to planning a long-term travel journey. I’ll be covering as much as possible in separate articles. Meanwhile if you have any of your own tips for planning a long-term travel journey do share them. Lots of great advice Dave … but I will add something that will differ: (as a New Zealander) I’ve always gotten visas on route including difficult ones like Yemen, Russia, and a Chinese work visa without ever returning home. The only region that one truly needs to plan visas well in advance is across Central Asia. However, West Africa (unless you’re French) requires visas obtained at embassies in advance (not granted on arrival but easily obtained in the neighbouring countries regionally). PS: I’m guilty of just arriving at start point and making plans as I go – as plans always change, and the journey becomes endless … over the years. Thanks for your contribution Michael, New Zealand seems to have one of those “magic passports” get in nearly everywhere! Have to generalize otherwise one will get a blast from India et al regarding their ability to get visas easily. Yeah, the visa dilemma for some nationalities must be painful … NZ is among a handful of nations that get an easier ride. One day there might be enough time to write up an impartial list of passports that allow access to the majority of the world. NZ being in the commonwealth would logically make it one of the more difficult countries in some regards. But then as you have proven in your vast travels around the globe the opposite seems to be the case for NZ! use the link to REAL RUSSIA on SEAT61 for a russian visa…. Many countries require a visa sure, but if your passport is issued in a Western Country the only places I can think of that requires you to be home to apply for your visa is Russia and possibly some former-USSR countries. Hello Lissie, you’re always quite welcome to disagree here. However as you duly noted yourself ” … if your passport is issued in a Western Country …” What if it’s not? Then getting visas becomes a serious undertaking mainly requiring applications from home countries. I’ll add in a note about being resident specific in the main text body to avoid any confusion. We were told by the Chinese embassy in Indonesia that we could only get a visa by applying from home. That’s with two Western passports and hotel bookings. The only thing we didn’t have was a return flight as we were going in via Vietnam. Thankfully in Thailand they gave us one. But it was terribly stressful. Like others have mentioned having a backup is important. And it’s rubbish to think a western passport will get you in anywhere. It’s at the whim of the Embassy. Doing some research shows others had similar problems. How many people have you met have had issues getting visas after they’ve left? And where have the main problems been for them? In terms of actual long-term travelers who did not plan. In other words those that just kept traveling rather than go home I’ve met quite a few. Biggest issues have been the mid east, Africa and Russia. A surprising amount of overland vehicle drivers simply get turned back due to carnet de passage issues. Trying to get an Iranian visa with a British passport is causing more headaches than value at the moment. And that’s trying from home! USA and UK passports have had issues with Iran for years. Best option is applying from home or one of those online visa options. It’s purely political. After reading Michaels quote within the article, I have to also attest to this whole heartedly. There is nothing that gets me more excited than laying a large map on a table and start to work a route across a continent. It seems that (at least to those that are more visually orientated) that when you view a large map and begin to join the dots that the plan really starts to come together. Visa’s are a thorn in every travellers side. To be quite honest they drive me insane when trying to plan a route for long term travel. Another example is for certain countries in Africa, they require the Visa be obtained in your home country, when countries like Australia and New Zealand don’t even have embassies for most Central or West African nations. From experience, I have always found that up to the minute info is best for difficult regions such as Africa. Always ask travellers coming overland in the opposite direction. As visa rules and regulations change at the drop of a hat (or a fifty dollar bill if you catch my drift). There’s one tip that I can give every potential long term over land traveller and that’s always have a general plan of your basic route, but also plan for that fact that things might and most certainly will change during your route. This is advice many people should heed. Thanks for including it Jason. Back up plans will save you a lot of emotional heartbreak and money if things don’t go as planned. I can attest to the West Africa visa mentality. What’s written online or on paper is one thing, actually getting the Visa is another story. Painful. Hi Dave, Your blog post is truly AWESOME….And from my side Global Visa it is the most successful immigration consultancy, with an unmatched level of popularity. Global Visas offers corporate immigration solutions to businesses, as well as handling visa cases for individuals. Hello John. I let your comment through but edited out the sales pitch. Do note I won’t allow any links, self promotion or advertising from for profit companies in the comments. Offer meaningful advice in the comments by all means, but no self promotion. Nothing better than having a map in front with the objective of planning out x number of days in each place. That was my favourite part of backpacking. Whoever believed that long-term travel doesn’t take planning should read this article. I thought you could wing and change your travel choices with little advanced notice but I forgot the visa thing. Planning or researching visas in advance and getting them in different countries along the way would be stressful to me. Glad I read this. One additional hassle to take into account is that airfare prices can change FAST. So if you’re heading to places you would prefer to fly out of keep in mind that the price can shoot way up depending on the season. I’m not the kind of traveler who buys plane tickets a half year in advance and sticks to an iron wrought itinerary, so I’ve found myself in a few holes in this regard. Believe me, it’s not fun when that $150 airfare that you looked up a month ago jumps up $800 when you have your departure dates set. The best way I’ve learned to avoid this is to be conscious of the cheapest seasons to fly (Jan-Mar, Oct etc . . ) and plan flights to correspond with these times. A good tip indeed Wade. Try out skyscanner.net’s calendar mode. It shows what dates are the cheapest too. Shame it doesn’t list all airline, but it is getting better. Great post! Brings back wonderful memories of planning for my RTW in 2004/05. Many great points you cover here. We are leaving for our trip in September so we have been in the planning stage for months and at times it gets flat out overwhelming trying to consider visas/festivals/weather and picking adjacent countries to efficiently travel to. There’s always too much information to take in with long term travel planning! Ah, good old maps. Better than GPS, do you reckon? Well, gps doesn’t work well when you are the planning stages.